In 1743, Britain was ruled by George II, although the Jacobites in Scotland were plotting to install Bonnie Prince Charlie to the throne. That year, Samuel Johnson was a 33 year old struggling writer and his still-to-be famed biographer James Boswell was just a toddler in Edinburgh. Also in Edinburgh, in 1743, exhibiting for a short time only, was Mrs. Johnston, an itinerant fancy glassblower. ‘Fancy' glassblowing refers to the process of working, not at a furnace, but at a table over an oil lamp with rods of glass. The artist formed the glass into small objects; rigged ships, animals, flowers, religious icons, beads and other ornaments. 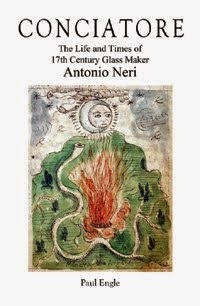 Glass spinning was a related process in which the heat of the lamp flame was used to draw an extremely fine continuous filament of glass that was collected on a large spinning wheel. The result was a mass of almost silk-like floss that was soft and flexible; nothing like the brittle glass of a cup or a window pane. Spinning demonstrations never failed to fascinate audiences and were a staple of fancy glass blowing acts well into the twentieth century. Artists would often take suggestions from spectators on what to make and then form the piece on the spot. A common technique was to repeatedly touch a thin rod of glass, called a stringer, along the piece under construction forming a series of little loops in the flame. Rows of loops build up a surface that resembles knitting and a skilled artist can form finished pieces quickly. Eventually, both spinning and the knitting techniques became known generically as ‘spun glass’. Although not well chronicled, this type of demonstration was performed at fairs and other shows as far back as the fifteenth century, and probably earlier. 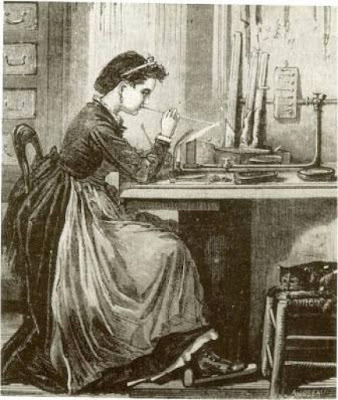 Because of their popularity with women and children, female fancy glass workers were not only well accepted, but commanded a premium at these events. For her own works do justly praise her most. The Caledonian Mercury, Edinburgh, Scotland, 10 Jan 1743, p. 3. Op. cit., 24 Jan 1743, p. 3.